I’ve used pudding mix in several recipes including lemon muffins, but I never thought to try it in scones until recently when I saw a copycat version of the Starbucks scones. That recipe calls for vanilla pudding, and since I’d purchased several boxes of lemon pudding mix for some reason (I think I was going to make a lemon version of the Quick Butterscotch Cream Pie), I was able to make Lemon Poppyseed Scones. Here’s a photo of the dough. I started with 1/2 cup of cream and had to add another tablespoon more, but go by appearance as you stir everything together. I like to shape scone dough into a rectangle and cut it into triangles rather than make a circle and cut wedges. Something about the sharp corners is appealing, but you can shape the dough the other way if you prefer or pat it thinner and cut it with scalloped edge cutters. As for the glaze, mine looks kind of hokey because I snipped the corner too much and made too wide of a drizzle, but nobody complained. Also, the icing is nice and lemony. Scones made with instant lemon pudding mix. Preheat oven to 425 degrees. Line a baking sheet with nonstick foil or parchment. Mix the flour, sugar, baking powder, salt, pudding mix and poppy seeds in a large bowl. 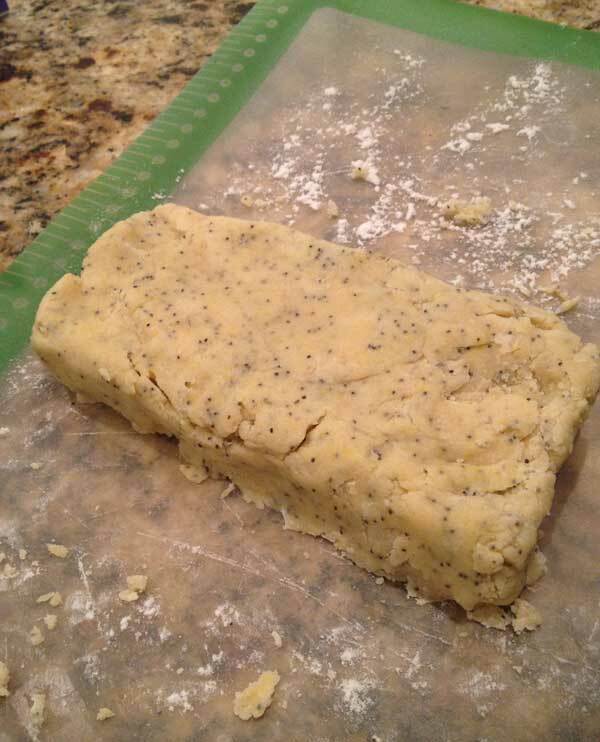 With a pastry cutter, cut in butter until crumbly and coarse. Make a well in the center and add the lemon zest, vanilla, egg and 1/2 cup of heavy cream. Stir with a spoon or heavy duty scraper until dough comes together. If it seems dry, add another tablespoon or two of creamy. You should be able to bring the dough into a ball with your hands. Divide dough in half and on a lightly floured surface, shape into 2 6x3 inch rectangles. Cut each rectangle into 4 triangles and place triangles the baking sheet. Brush tops with heavy cream. Bake for 10-13 minutes or until edges and tops are nicely browned and center is cooked through. Let cool while you prepare the icing. Put the butter in a 2 cup Pyrex measuring cup and heat in the microwave for about 30 seconds or until melted. Add the powdered sugar and stir well. Mixture will still be powder and dry. Add 1 tablespoon of lemon juice and stir well, then continue adding lemon juice 1 teaspoon at a time until the icing is a good consistency for drizzling or piping. 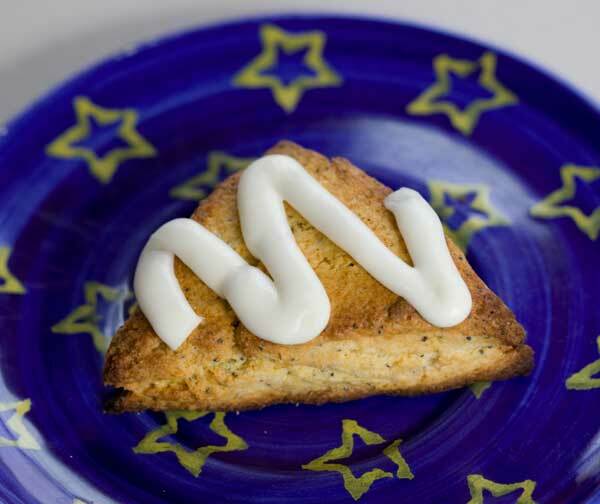 If piping, put in a decorating bag or freezer bag, snip off the end (or corner) and pipe over the scones.